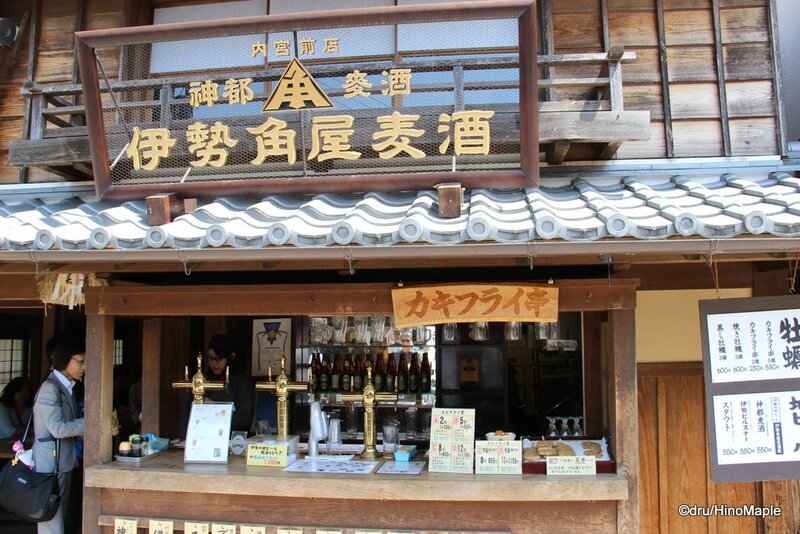 Ise Kadoya is a somewhat famous craft beer company that is located in Ise, obviously. When I was in Ise, I had to visit their shop. They have 3 shops in Ise but I only went to two. Their main restaurant is located a fair distance away from Iseshi Station, so I couldn’t go there. The menu is also similar to their Naiku restaurant. When I arrived in Ise, I got to the Naiku area around lunch time and the first thing I did was head straight for Ise Kadoya. Their shop on Oharaimachi looked interesting and they had a teishoku set that looked good. They specialize in oysters which is why I decided to go there. It isn’t too far from the entrance to the Naiku but it isn’t easy to get there when there is thousands of people just leisurely walking up and down the street. Finding the Naiku shop is a little difficult as many of the store fronts look similar. As long as you are looking for it, it wouldn’t be difficult to find as their logo is on the shopfront and they have several beer taps on display as well. The restaurant actually has two sections. The first section is near the entrance. This is the stop and rest section, as I call it. It is where you can get a quick pint and a few oysters. It is a nice place to relax and watch people go shopping. It can be pretty busy at times as the area is pretty small but the beer is always delicious. 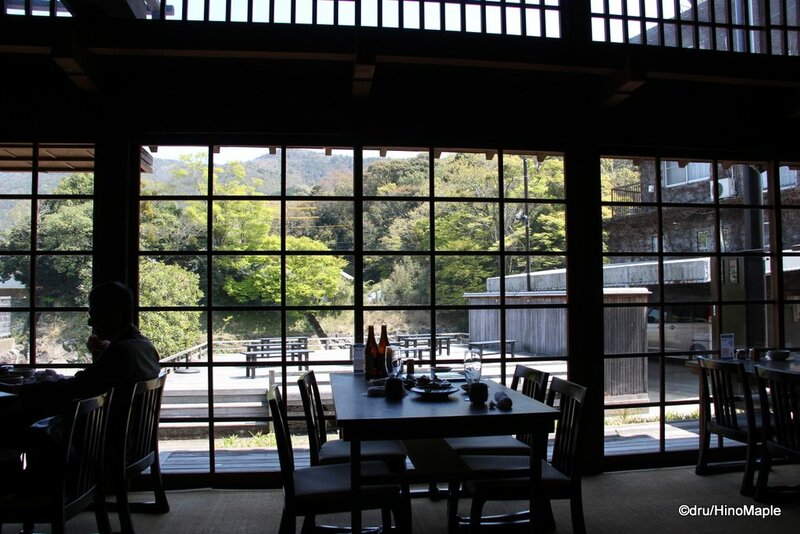 Inside is the teishoku restaurant where you can enjoy a nice seat on the tatami and relax as you eat lunch. From what I can tell, they are open all day. The beers available come in 6 different flavours. 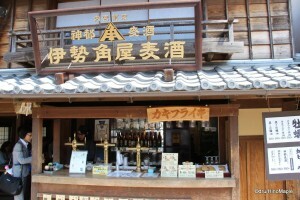 They had their stable 4, the Shinto Beer, Stout, Pilsner, and Brown Ale. 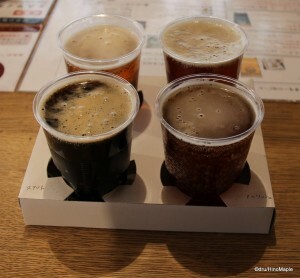 They also had 2 seasonals, an Irish Ale and their Kumano Kono beer, when I visited. The Shinto beer is a pretty standard beer but the quality is higher than your typical Kirin Ichiban Shibori. The other standards were just that, standard. While the quality is higher than your typical commercial beer, the flavours are on par with any other craft beer. The Irish Ale and Brown Ale were my favourites but the Stout had a great malty flavour that made me want to stay all night. If you are ordering from the bar, you can get a 4 glass sampler set and you can choose from the 6 beers on tap. Unfortunately they didn’t have any beer bottles available or any really interesting seasonals when I visited. The food was also very good. It was not as easy to order food as the menu was a little unique compared to other restaurants that I have visited. There were 3 basic sets and each of those sets came in different levels. Basically, you had the oyster set, deep fried oyster set, and the eel set. The eel was Hitsumabushi, which has thinly sliced grilled eel on top of rice. Each set had different levels from luxury to standard. They used words such as “matsu” and “take” but I had never seen these words used to describe teishoku levels before. The only difference is in what options you had along with your meal. The standard “matsu” was just the bare bones. As you increase the level, you could get more oysters or more eel. It took a while but I was finally able to translate the entire menu and help my parents find a good meal. The interior of the restaurant is also pretty good. It isn’t large but it has an old look to it. 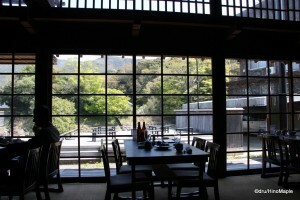 There are three sections, a main tatami area, a party table, and a couple’s table. The main tatami area has several tables with low seats. 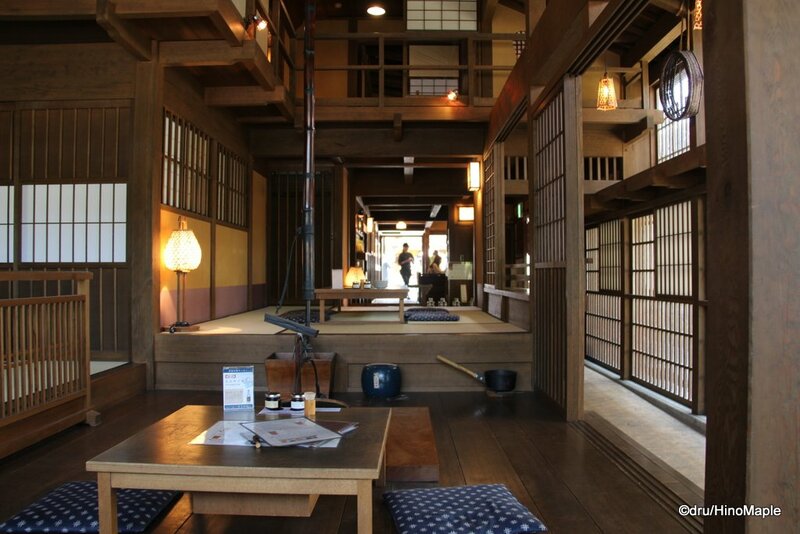 Rather than sitting directly on the tatami, you enjoy a slightly risen chair so that your legs don’t get too tired. This area also allows you to sit at the windows and enjoy the view of the river behind the restaurant. The couple’s table and the party table forced you to sit directly on the tatami as the tables were much lower. The party table is able to hold 8 people at one time and when I entered the shop there was a boisterous group of older people having a good time. Thankfully they left soon after I arrived and the entire area was pretty quiet after that. The couple’s table is pretty small and next to an old hearth that I doubt is used. It can feel more romantic but to be honest it didn’t look very romantic. It looked as if they just didn’t have space for a bigger table so they made it into a “couple’s table”. No matter where you sit, I’m sure you’ll be able to enjoy the restaurant. 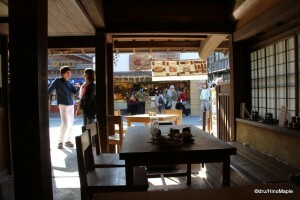 A lot of the interior uses wood and other natural products. It is a relaxing place and you can spend a whole day there if you really wanted to. When I was there, a nice lady was enjoying a full pitcher of beer on her own. I think she didn’t want to eat but wanted a nice place to sit and enjoy reading her book. In order to do that she had to pay the “cover charge” of buying a full pitcher. I don’t blame her as it was a lovely place. She ended up offering her beer to other guests because she couldn’t finish the pitcher on her own. 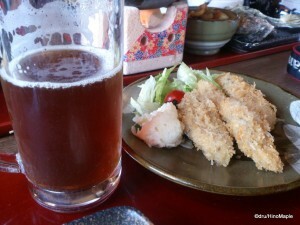 Her English was also decent enough to offer it to my father who was having the same Shinto beer. Since I was having the Irish Ale, I couldn’t really have it. The workers are all pretty good too at being courteous but they also lack English skills. They seemed almost relieved that I could speak Japanese and never once tried to use English with me. There were a couple Belgian visitors that got a couple beers at the waiting area and they seemed to be having a tough time ordering. I’m sure the workers did their best to help them but it was pretty difficult for them when English is barely spoken. When visiting Ise, I found that most of the shops couldn’t communicate well in English. It was not easy for a foreigner to get anything but thankfully my Japanese was strong enough to communicate. If you do go to Ise, make sure you stop by the Naiku shop and have lunch as you won’t regret it. This entry was posted in Chubu, Chubu Food and tagged beer, Chubu, craft beer, Ise, Ise Kadoya, Ise Kadoya Beer, Ise Kadoya Biya, Isekadoya, Isekadoya Beer, Isekadoyabiya, japan, Ji-Biru, Mie, Oharaimachi by Dru. Bookmark the permalink. The interior of the restaurant looks gorgeous. I love the old Japanese look. Thanks for the look. Never knew it was somewhat common. As I said, it was the first time to see it. Yes, the interior is gorgeous. I loved it so much.